Is it too Early to discuss c19? I want a Serra Planeswalker. I've been wanting her since C14, when they trolled me with Nahiri. I also want the WB sister from Innistrad. More cool reprints would be nice, but those have been covered in this thread. What I want to see are characters from the lore, with their shiny arts. Oh, and I would love to see the enemy versions of the Battlebond lands and/or enemy versions of the AKH or BFZ duals. Enemy cycles of some of the land cycles they've printed the Allied cycle of would definitely be nice. Especially the fetchable BFZ ones. We are missing the other half of the cycles of Bond lands, Battle lands, Reveal lands and Bicycle lands. Bicycle would be my #1 for getting the missing half of the cycle. "Oh shame for you, you activated my Alucard"
I would love to see some more weird decks... just stuff that hasn't been fully explored or fleshed out yet. I'd love to see something like Necrotic Ooze as a Sultai Commander [legendary ooze]. Something focused around making some kind of really crazy synergistic monster. I would also be interested in another really political commander, but not group hug. Something more like Pheldagriff would be great, or maybe something like Sen Triplets? I think a -1/-1 counter Jund commander could be really cool, but they just did Jund in C18. Another fun deck would be Red/Black chaos, something I have always wanted to attempt to build but never had the guts. Perhaps all the recent coin flip cards are a sign of what is to come? Have we had a dedicated Blink deck really? That could be fun. I probably would not mind seeing a colorless deck themed around the Eldrazi, but only if they retconned it so you could include Devoid cards in a deck with a colorless Commander. I would also really love to see a Morph themed commander: Preferably either Sultai or Temur. This seems like a likely choice because it has a lot of support already and could easily be made really viable with the right commander at the helm and some juicy new cards. Last but not least, please give me a Saproling themed deck. I know we have Ghave, but I need some more cards focused around Saprolings. I hope at least some of them do something unseen before and/or are open ended enough to allow for new type of deck. Not just a new commander that can helm an already well established deck or another race/class lord. I want Zedruu level novelty. Also, more cards that are "overpowered" for normal magic but ok in multiplayer like the Battlebond lands nd Command Tower, but on nonland cards. The secret to enjoyable Commander games is not winning first, but losing last. If my post has no tags, then i posted from my phone. As I posted earlier today in the C19 reprint thread, the most recent episode of the Tolarian Community College podcast consisted of a lengthy interview with Gavin Verhey, in which he talked about a lot of things, incluidng commander and reprints. He confirmed that we are very unlikely to ever see fetches printed in Commander products, and that it is even less likely they will ever be part of the Standard environment again in the foreseeable foture, but that they likely will be reprinted in some other product sooner than later since it is recognized how important they are for Legacy and Modern. He also noted that Wizards has heard the critiques of the poor value of the reprints in the C19 set and that this will be an area of improvement in the future. He also noted that with the demise of the Masters sets, it is likely some reprints people want to see for Commander and Modern will likely be showing up in future Commander releases, as well as future Battlebond and Conspiracy sets and maybe things like the Spellbook sets. Finish cycles we only have half of. Talismans, Tango lands, etc. Maybe they could make decks that have multiple thematic subthemes embodied by the reprints and the new cards? Four Directions. Four Seasons. Four Elements. MaRo stated that they used the past couple commander sets to make cards for previous story characters that never received a card, or niches that needed filled. Fantastic! A lot of the community really likes that. However, the designers shouldn't let that stop them from coming up with some new, truly inventive cards like Zedruu. Finish the missing colour pairs. Dimir, Rakdos, Orzhov, Selesnya, azorius, Gruul. I'd love to see this too. Would like to see more wedge coloured commanders. Another junk commander. Or some kind of token/ counter commander like Ghave, but then in Bant colours and with soldier tokens. we have an orzhov deck. It isn't good but it exists. How i feel about competitive players and casual players in EDH: The competitive are german tourists, the casual are italian tourists, both in a italian beach. The italians asking themselves "why are the germans here?" make a legitimate question, the answer is because the beach is beautiful, no matter the country you came from. The italians wanting to ban the germans are dumb, because if the germans pay for their stay and follow the rules like everyone else, they have the right to be in the beach. Hovewer, if the germans started to ask themselves "why are the italians here?"... they would be dumb as hell. I am also looking forward to the better reprints that were mentioned by Gavin Verhey. They know C18 decks fell short on the reprints and they want to fix it going forward. Not having to save a lot of reprints for Masters sets is going to help. I can see that. I really want Wedge commanders, with the Partner mechanic. Finishing the Talisman cycle would be awesome. I am doubtful they will finish land cycles for EDH, but it would be welcomed. That being said, if they continue only making 4 decks it will make it hard for them to complete cycles for make a Wedge commander theme. 5 cards do not split evenly into 4 decks. Do we know if they will revisit the change to 4 decks? The New World fell not to a sword but to a meme. That's a really good question. I haven't heard any mention of that one way or another. I would hope that they would be open to that depending on what they decided to do with a given year's releases. If they decided to go with a wedge theme or an allied color theme or whatever, it would not make sense to leave out one combination. I am holding out hope for someday seeing allied-color commanders with the experience mechanic. In my dreams, we'd get 5 ally-colored commander decks. 1. Each would have an allied color experience counter commander, an allied color partner, and two mono-color partners. Even getting one of those things would make me happy. 2. Each would have 2-3 rare lands. I'm not asking for fetches but SOME small part of the value should be seen in the mana base. , add . If you control four or more basic lands, add instead. 4. No tribal that can't be supported already. The C17 decks showed that wizards can only really fit a cycle of tribal commanders, 2-3 new tribal cards per tribe, and a cycle of generic tribal support. If a tribe (like Kavu) is not already self-sufficient for a tribal deck, commander decks are (somewhat ironically) terrible for changing that. Even if people would love a kavu deck, packing existing kavus with 3-4 new support cards does not a good deck make. If an established tribe like allies or goblins get a tribal deck, however, that is fine by me. 5. At least one (semi-)chase reprint per deck (maybe two if wizards is ambitious). I want to see a $7+ reprint in each deck. This should not be too much to ask for. Really, it shouldn't be. 6. The absolute value of the deck (including the cards that we would never be able to sell) should exceed the MSRP of the deck. 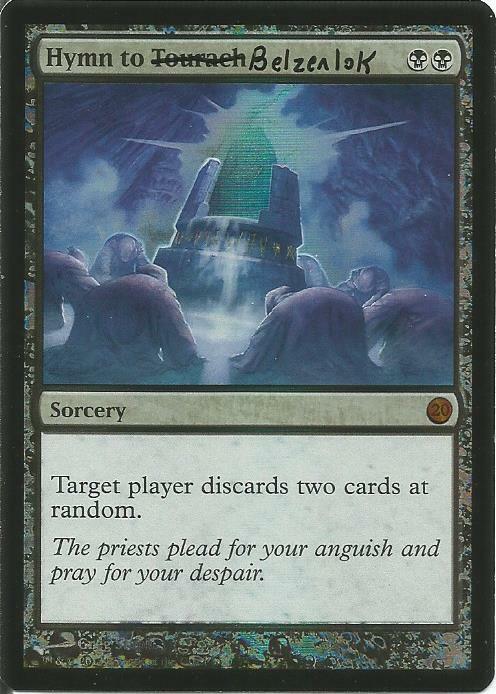 Wizards has always been pretty good about this (at least at the time of release) but I still want it to be said. 7. Coherent decks. I am fine with not all decks following the same thematic wavelength (I am fine with one deck being about a plane, another deck being a tribal deck, and a third deck being a dedicated combo deck). I am fine with secondary themes in decks (like equipment in cats). If Wizards cannot succinctly describe a deck (as in the Windgrace deck), however, that deck is a mess and needs to be refined. That is basically my full wishlist. MaRo stated that they used the past couple commander sets to make cards for previous story characters that never received a card, or niches that needed filled. Fantastic! A lot of the community really likes that. 3 cards have him in their name, 5 cards mention him in their flavor text, 0 cards depict him or represent him. We need a Tourach! Tourach, Serra and Gix compile my list of characters I want to see. 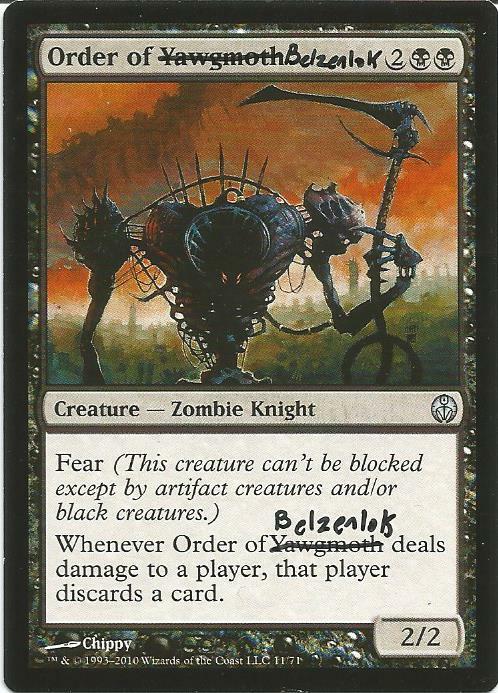 I need a Tourach so I can put him in my Belzenlok deck with his named edited to be "Tourach Belzenlok, the Foo Bar". The deck is already running Hymn to Tourach Belzenlok. I don't even care how good he is. The deck already has bad cards, like Order of Yawgmoth Belzenlok. Hey, a theme is a theme. If that's your goal, you play sub-optimally. I play some fairly average stuff in my Kresh deck. I feel like Partner is one of their better Commander innovations in recent years, and there's definitely a lot of space there to explore. You don't even really need Partner to be a 'main' mechanic, so much as just have a small amount of them in each deck. This just freshly in my mind as I've tried to figure out what to do for my non-red deck, heh.